This man Willard had written many books and he travelled extensively. This time Africa is his target. His travels take place in a fast changing time. Colonies become independent, there is a resurgence in Africanness. The winds of change are blowing strongly, and what will come next is blowing in the wind. 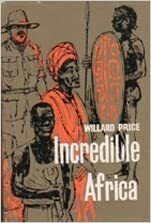 Price starts his book with an overview of the African continent. He is of the opinion that there was highly evolved black culture in Egypt, then people moved southwards and their civilisation declined. He notices a wealth of natural resources and he wonders if Africa is the richest continent of them all. He starts his journey in Egypt, an independent country, but heavily influenced by British and French culture. In Marocco he notices the very important influence of Morish culture in passing on the Greek heritage. In one way there is a leap forward in this country, on the other hand there is a retrogressive move. He travels by way of the enormous desert Sahara, Dakar, Guinea, Liberia ( an internally divided country), Ghana (where he finds his own books in a library) with a thriving economy and Nkhrumah who wants to bind more countries to Ghana. In Nigeria he meets the very important and charismatic politician Abubakar Tafawa Balewa (who died in 1966 in a coupe d’état). I once visited his grave in the northern city of Bauchi. He was highly spoken of in those days. In Gabon he meets with dr. Albert Schweitzer and he is very impressed by the meeting with this man. He likens mealtimes with Albert with the Last Supper of Jesus Christ. In Congo / Brazzaville he visits the house of Charles de Gaulle, who spent time here during the second world war, when the Free French were fighting against the Nazi. He wonders if this ‘small’ country should be taken over by Congo / Kinshasa. Travelling through South Africa he speaks out against apartheid. In Mozambique he sees a different kind of apartheid. Here the dividing line is between different levels of civilisation. He visits an island of the coast where Portugese have lived since 1498! On the eastcoast of Africa he takes his time to see some wildlife. He is awed by the number of animals he sees, especially in the northern parts of Mozambique. He notices the uncertain future of the white tribes and the growing investments by the Sovjet Union (replaced in the meantime by China!). The hope for Africa is found in Nigeria, Ghana and Kenya (not South Africa). He refuses to place the African at a lower par with other continents and races. He thinks that Africa has been kept out of world war 1 and 2, but we know history was not like that.